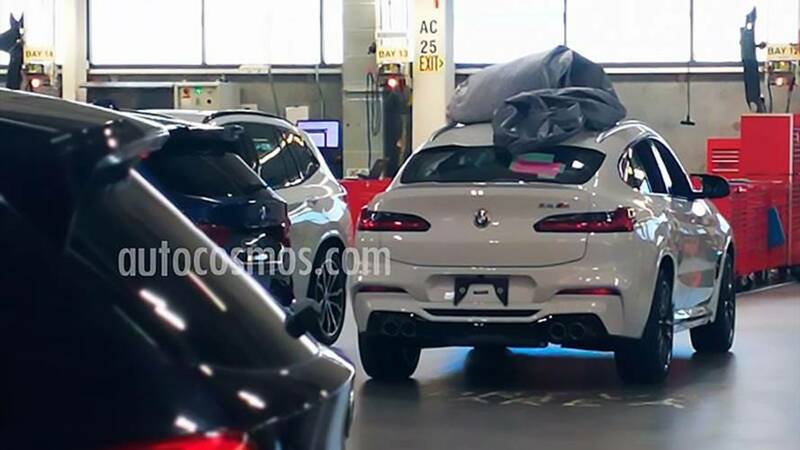 A new photo from Autocosmos.com.mx shows the BMW X4 M uncovered for the first time. A previous video of the X4 M at the Nürburgring had the crossover in camouflage. The photo reveals the M badge on the liftgate positioned above the taillights. The standard BMW X4 has the badge below them. The rear diffuser is new, making room for the larger circular quad exhaust, and there's a small lip spoiler on the edge of the trunk. The X4 M borrows the same side-view mirror design as the X6 M. It's difficult to tell if the wheels are unique in the photo; however, they should be 21 inches in size. A biturbocharged 3.0-liter straight-six engine from the M3 and M4 should power the X4 M. BMW hasn't confirmed this. The engine should deliver around 475 horsepower (354 kilowatts). The X4 M will receive a lower ride height, larger wheels, stickier tires, and larger brakes. This should improve the crossover's handling. Inside, upgrades over the current range-topping X4 M40i will likely be minimal. Expect Alcantara upholstery and carbon fiber trim. The BMW X4 M should debut before the end of the year and go on sale in 2019. In the United States, the standard X4, including the X4 M40i arrives at dealerships this month. Customers will have to wait if they don't fancy the 355-hp (265-kW) X4 M40i, which has a starting price of $60,450. The BMW X4 M will slot below the 567-hp (422-kW) X5 M in BMW's portfolio. The X4 M's starting price should reflect this performance difference. The X5 M starts at $101,700. We should know details about the X4 M later this year at its unveiling, including its performance. Pricing may come then. However, BMW could wait until closer to the crossover's arrival at dealerships to confirm the starting price. There should be several optional packages available.